Desk Report: The central bank will take punitive actions against 10 private banks for failing to attain their farm loan disbursement target in the last fiscal year, reports The Daily Star. The banks are AB Bank, First Security Islami Bank, Meghna Bank, Modhumoti Bank, NCC Bank, NRB Global Bank, Shimanto Bank, South Bangla Agriculture and Commerce Bank, Farmers Bank and Union Bank. As a punishment, the Bangladesh Bank will block 3 percent of the undisbursed farm loan amount of the banks from their current accounts with the BB. A BB official told The Daily Star yesterday that the central bank would return the fund to the respective banks if they can distribute the undisbursed amount along with the fresh targets in the next two fiscal years. The banking regulator, however, does not return the blocked funds if banks fail to disburse the amount within two fiscal years. No interest is given to banks for their blocked funds. AB Bank disbursed 81.96 percent of its farm lending target in 2017-18, according to data from the central bank. 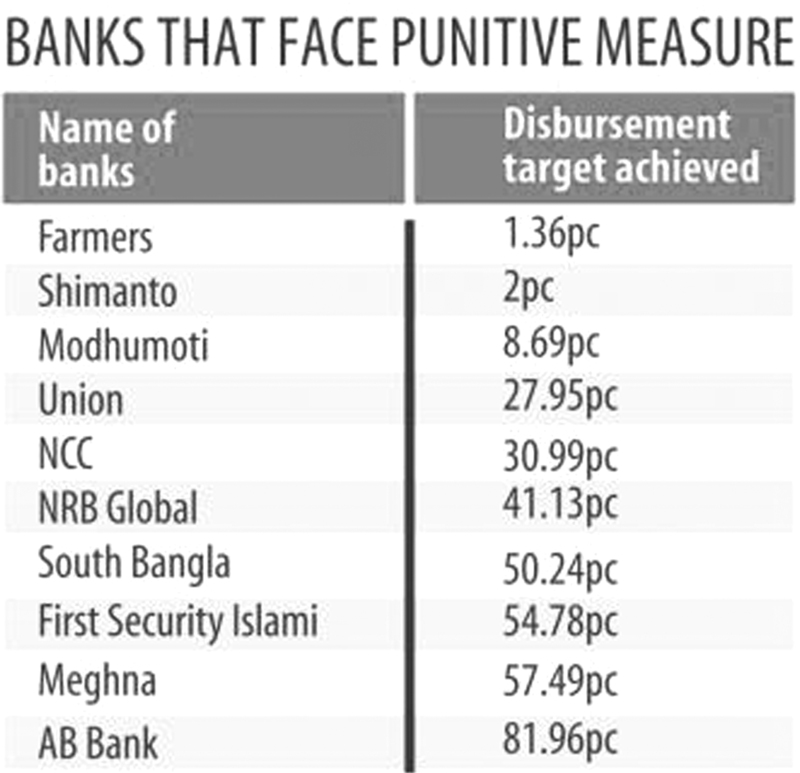 First Security Islami Bank distributed 54.78 percent of the disbursement goal, Meghna Bank disbursed 57.49 percent, Modhumoti Bank 8.69 percent, NCC Bank 30.99 percent, NRB Global 41.13 percent, Shimanto Bank 2 percent, South Bangla Agriculture and Commerce Bank 50.24 percent, Farmers Bank 1.36 percent and Union Bank 27.95 percent. The central bank will block the fund this month and will not serve any show-cause notice. The banks will be notified after the fund is blocked. Bangladesh Development Bank and Sonali Bank also failed to reach their farm loan lending target. They, however, will not face any action, as the BB has exempted the state-run specialised and commercial banks since they are already burdened with the responsibility of providing various voluntary services to the public.